Re: Team Dudge build diaries. Post AWS report! Much more post event analysis than after Ant freeze as I got into more matches this time. I'll start with the bad - Manticore is a sucky robot. I always knew the hammer was more for fun than competition haha but nevertheless I am disappointed in his matches. Two clear losses where I drove badly, had almost zero head to head pushing power, and yeah. I just don't like driving the 2wd set up. Upside I guess is he came out without any damage. I am unsure yet whether he gets another chance. He is in full working order so maybe he'll get to another event. 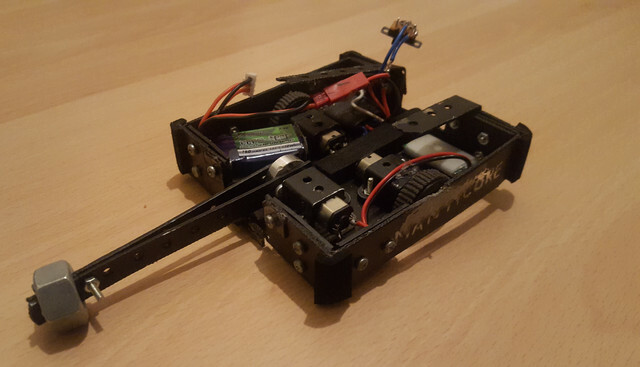 Or maybe I recycle ESC and motors from him into something else. We shall see. On to the good though - Third Law had a much better time. His first match was vs Hestaephus in a driving/pushing match and he came out on top. So much easier to drive this guy compared to Manticore. A good start! Second match was against one of my favourite teams and George's scary overhead bar spinner Vampire. I was curious and a little nervous to test against a spinner and here was a very fierce one. This match was my personal highlight for the day. 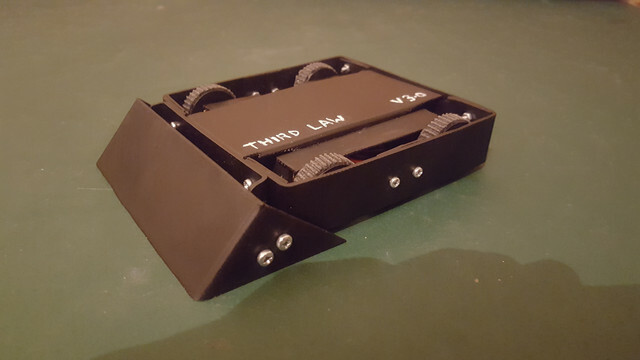 I've watched enough antweight fights now to know I had to take the beating and hopefully the horizontal spinner would eventually find itself bouncing out the arena. Which was basically what happened. Not before he got some really good hits on me though, including one that hit that got above/around my wedge and which was half a centimetre from ruining one of my wheels. Luck might have been on my side a little here but I'll take it haha. Then it was back in the draw and here things went a bit south for dear Third Law as next he drew another scary horizontal spinner in Nom Nom Nom by Andy who prior to this I just knew as the Formula/Rapid dude. Ok, I thought, freshly full of vigour at having beaten one spinner, same tactics again, right? May be a third win here and a bit of an upset? Nope. turns out back to back sessions of getting punched in the face was a bit too much. It started out to plan. First couple of hits went ok. The wedge on my bot worked pretty much great against the spinners. However the rest of the bot was NOT up to the beating and after a few hits from Nom Nom Nom one of the pins holding the lid in place came out. Another hit and guts are out, namely the eviscerated Lipo hanging where it shouldn't be yet another hit and I have lost some drive ability and the exposed battery also took a nick so it was time to tap out. The battery was very quickly ejected from the building and closer inspection revealed he had hit me hard enough to unsolder a drive motor. Ouch. Then I got my first proper experience of some panicked repairs before my next fight. (yay for hot glue) It was briefly a bit nerve wracking but I got him ready to fight Die Gracefully Dave's Insject in what I thought might be a good match up for me but he's a damn good driver and maybe I was feeling the stress of repairs more than I realised and either way he had me out the arena pretty quick and with that I was out the main competition. Unlike Manticore, Third Law is definitely continuing forward. I plan on another rebuild to improve him. The wedge worked really well and I think overall he is a competitive robot. But i need to make another body that is a tiny bit lighter so I can focus on securing internals better. Obviously next time I would rather my bot's insides spent the whole event inside the bot and not flopping around like some Game of Thrones extra that got stabbed up. I'm thinking maybe a foam insert or something that means I can still easily get the battery out for charging but will reduce the chance of what happened vs Nom Nom Nom from happening again. All in all a really fun day. Thanks to everyone involved in running it and many kudos to all the roboteers. Especially Shakey on his tournament win. edit: vampire, not Valkyrie. should've remembered that! Last edited by voorsk on Sun Jul 01, 2018 9:10 pm, edited 1 time in total. Well in a weird way I oughta be glad it was the battery as it's about the only part I had spares of lol. There was an ohh sugar moment though when he hit me and the Lipo just flopped out from where he'd opened the top up! Not supposed to happen! Funny really because right before that happened I heard someone close by me say ohh well it's taking the hits well. Cursed it haha. Oooh, and Vampire was the one of George's I fought. 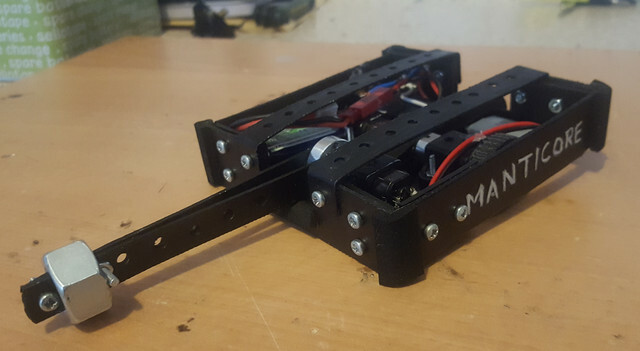 Valkyrie is his drum that got pretty far in the rounds (and also probably my favourite 150g robot). I haven't fought that one yet although I'd be interested to at some point to see how it compared to the horizontal yesterday. At least it was only the lid. My whole bulkheads seperated from the base when I was out of the annihilator, and was draped over the side by my servo wire. Hot glue was my repair method too. Hey folks! 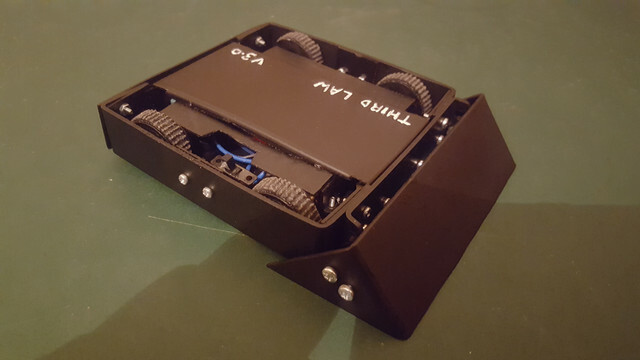 Am still alive Had a few months of life doing it's thing and keeping me away from the fun stuff but seeing as I can finally get to another event with Ant Freeze at the start of Feb, thought I oughta get the bots out and see what I can enter. Not attempting anything totally new because I'd be pressed for time/parts by 2nd Feb but both robots from last time were in mostly one piece. Manticore just needs a bit of a dust off. I still want to re-use the bits from him at some point to make something a bit less totally rubbish but it won't be this time round. This time he'll get to come along again mainly so I get a couple more matches in the day. If he has to fight a spinner I imagine he'll be retired afterwards. Third Law is where I'm spending my time. After back to back fights against spinners last time he really needed a rebuild and I had enough plastic to make a new body and once a new battery was added it seems all the insides work fine so time for Mk3. Mk2 did loads better than the very first version so the plan is to try to refine further and make sure that I don't lose the same way again etc. One big problem with both other versions was that I was always fighting against weight and *everything* ended up drilled and trimmed and drilled some more to shave weight and in places it weakened things structurally. 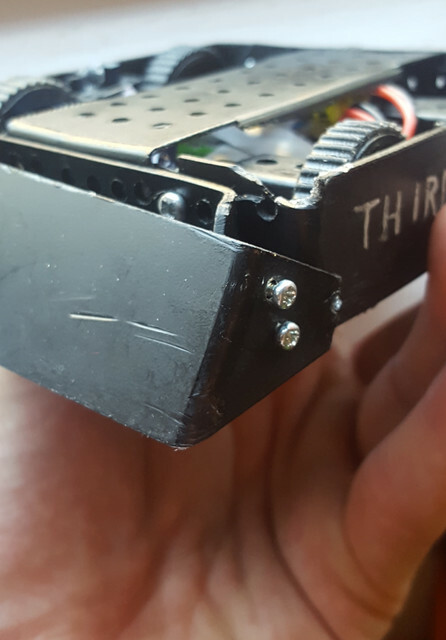 It cost me in the end as my flimsy lid fixings and poor battery fastening fell foul of shock from impacts and I went out with a intact wedge taking hits but guts flopping around behind it. This time I have shrunk things down. I bought smaller wheels from Nuts and Bolts a while ago and this time I went with those. The whole profile of the robot is 5mm shorter than before. Which is obviously quite a bit of plastic around the whole bot. Plus lighter wheels and lighter motor mounts and I did buy one more thing, some slightly lighter bolts. So this time no holes! And a wider lid that can be better fastened. 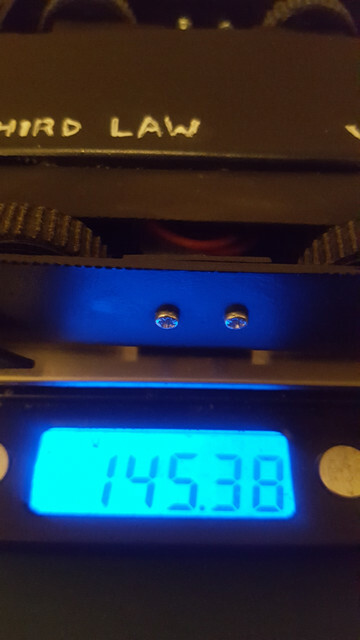 And enough weight to secure the battery with more than the smallest scrap of Velcro. Finally got Third Law's rebuild finished. I think he's quite a big improvement over the last version. At very least he should not be losing the same way again. Hopefully I can drive well and do him justice! 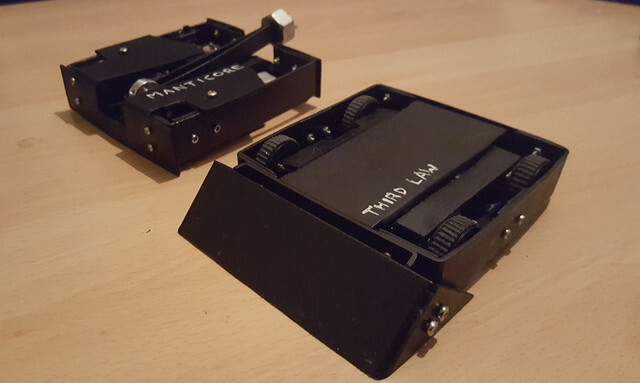 nice... simmilar to 187 in design... im currently waiting on some polycarb to arrive for my rebuild... not happy with the carbon fibre although itll do if i dont get my parts in by saturday... how much does your chassis alone weigh? and is that 1mm?1.5mm? I don't have an exact number on the plastic but it's roughly a half and half split on weight between chassis/armour/wedge and then internals. Slightly more weight in the externals maybe. 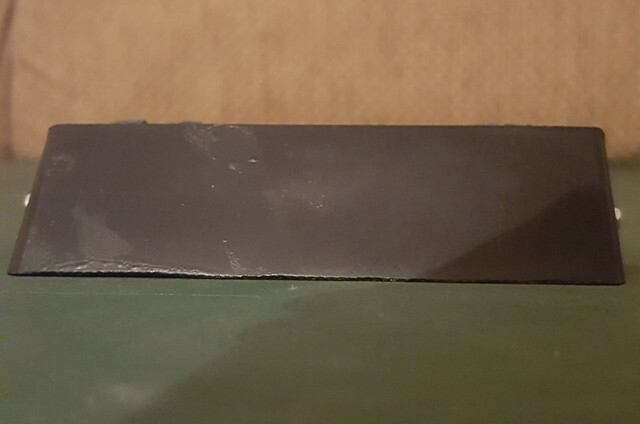 The way the pieces overlap there's nowhere around the side that isn't at least 1.5mm and in many places it's double layers. 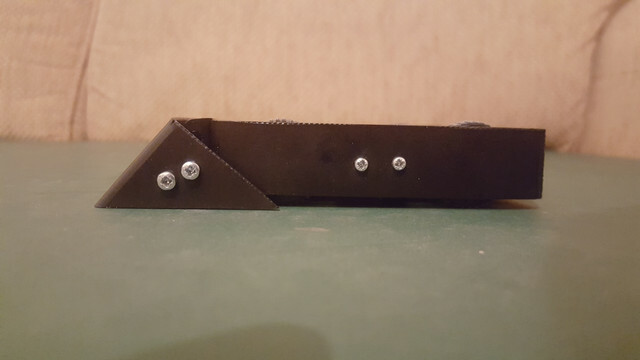 Hopefully this time now I got the size right at last (Third time lucky) and haven't had to use any extreme weight saving methods, it should be pretty tough. Totally unexpected results for Ant Freeze 6! Colour me surprised. Third Law who I had decent hopes for had a good start in the Nuts game, winning it's heat and getting into the semis. Alas it was a rapid downhill from there. In the tournament it failed to win a fight, getting pitted by team Oink's walker that has an uncanny amount of pushing power and then by team OwO's Really Lengthy Name in a very even driving match that I was outdriven in. Ooof. So much for the bot I spent all my time on he was then adopted by young Owen who was there with his mum Sarah from Bugglebots who gave him a makeover and looked to be having fun so I'll call it a win overall. And then there was Manticore who I had no hopes for at all. Big surprise as he made quite a bit of progress, winning three fights along the way. He got the better of a driving dual with a flipper robot called Elevator, before dropping into the losers bracket after getting pitted by Plan B. Then he got to fight Pete Waller's Defiant and managed to get a few good (well, at least they hit the opponent) swings of his little hammer in. Then I finally got my antweight rite of passage of fighting one of Shakey’s feared spinners, Don't Hug Me I'm Scared. He caused some pretty awesome damage and confirmed that I have a rebuild job on my hands I survived long enough for him to go in the pit though and so I got one final match vs team Limpet’s drum spinner which finished what Shakey started and split my front armour plate and left Manticore pleased with himself but very much grievously wounded. All in all a really good day. Highlights include team Zero's crazy gyro walker, team Nut's fork wielding bean tin robot that seemed to be powered by violent seizure, Manticore’s surprising tournament progress and the general great atmosphere. Shame it got rushed at the end but bad weather is not easy to plan for and it didn't spoil the fun at all. Big thanks to Limpet and family for organising. Sadly I can't make the imminently upcoming AWS, but I will definitely be looking to get to another event before too long and look forward to seeing you lot again! 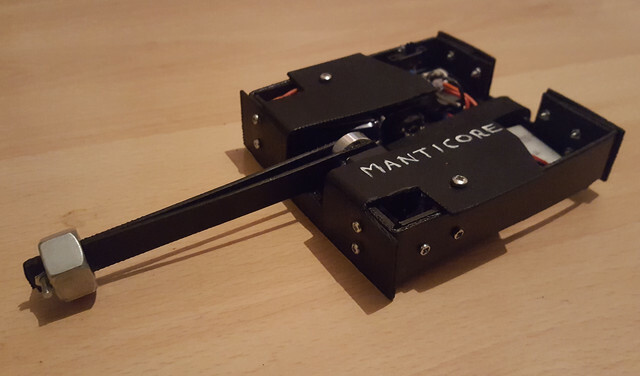 So the plan before Ant Freeze was I would recycle Manticore after and make something else but his spirited effort won me round on him a bit and with me still having one more 50:1 motor I bought as a spare for the hammer - he lives on yet to fight again at another event. 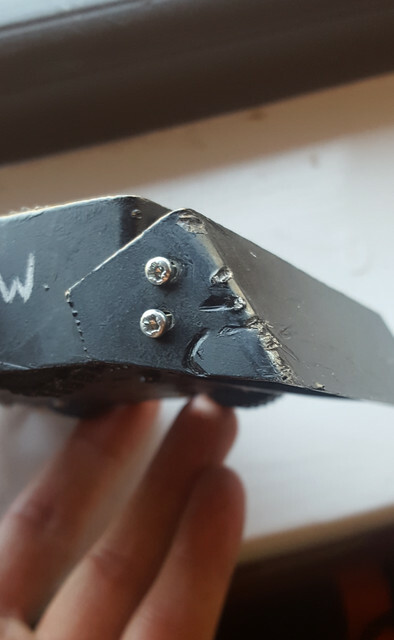 The full list of repairs required after fighting Don't Hug Me and team Limpet's drum was a fully snapped in half front armour plate, cracked side armour, destroyed top supports, broken hammer arm, some wiring damaged, and a dead hammer motor. Ooof. Them bots hit hard. The main chassis, some of the armour (the bits at the back ) and all other internals were ok though. And I had enough plastic to rebuild the rest. So I swapped out some smaller bolts and trimmed a few wires and things and saved a little weight to hopefully made the front a bit more spinner proof than before. Now I really wish I could go to AWS in a couple weeks alas work won't match up. Gonna look into whether or not I can do botfest in March.